We love private parties, bachelor and bachelorettes, girls night out and company events. 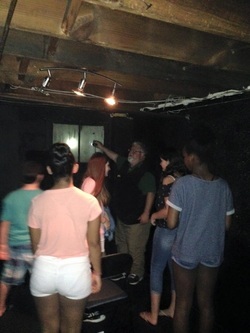 Your group can enjoy our Haunted Pub Crawl, Haunted Memphis Bus Tour, one of our Ghost Hunts or other event just for your group! Our 22 passenger bus is also available for group outings. Here's what one of our private parties said about their special night. "We had the Historical Haunts Memphis Bus Tour as a part of our Company Christmas Celebration "The Ghosts of Christmas Past - Memphis Style" last Saturday Night and it was FANTASTIC! It was a huge success with our employees and guests. The Chemistry between the H.H.M. staff really made the evening lots of fun. So many historical facts and eyewitness observations really gives credence to the tour and you know that just not made up stories for effect. Everyone in our group is ready to try out some of the other tours. Thanks from all of us at Graphic Systems, Incorporated for a truly memorable evening." Now you can book the most amazing teen birthday party or event EVER! Private Parties are scheduled at our downtown location and are a specially designed and presented version of our 2 in 1 Walking Tour and Ghost Hunt. We meet at The Broom Closet, the scene of the murder of a young Memphis police officer killed in the line of duty. Ghost Hunt! Is a 1 1/2 hour fast paced event and may run slightly longer depending on the group and activity. The evening begins after dark, start times depend on the season. The evening is suitable for ages 12 - 17 and other groups can be accommodated on request. Ghost Hunt! Events are $275 minimum for up to 15 guests, additional guests are $20 each. Contact us using the contact form on this site.